You may want to skip Supergirl: Beyond Good and Evil and the following trade, Supergirl: Way of the World, and just start with the Sterling Gates creative team that comes along after. After Joe Kelly's madcap, just-so-wrong-it's-right take on Supergirl in Supergirl: Identity, writer Kelley Puckett and artist Drew Johnson offer a more traditional take on Kara Zor-El that ultimately has less controversy ... but also seemingly less substance. I firmly believe that Kelley Puckett's run on Batgirl, along with art by Damion Scott, should be listed as a definitive Batgirl (Cassandra Cain) creative team. It was obvious Puckett understood the character, writing a series of nearly-silent one-shot issues that developed Batgirl while remaining true to the core of the character. To this end, I expected very much to enjoy Puckett's work on Supergirl; he's shown he can write young, female characters in an even, unexploitive, interesting way. The difficulty is that Puckett writes Supergirl here almost as if she were Batgirl. There's great, great swaths of silent pages here, as Supergirl exchanges knowing glances with Superman as she looks back into Krypton's past, or fights the classic Supergirl-villain Reactron (in a new, fairly generic form). This silence only reinforces the plainness of Puckett's Supergirl story; as opposed to Joe Kelly's bad-girl Supergirl, Puckett's Supergirl has an equal stranger-in-a-strange world vibe, but shows it only through the generic superhero tropes of saving civilians and battling bad guys. Puckett, to his credit, is moving toward a larger tale where Supergirl, bucking traditional superhero tropes, tries to cure a disease-ridden boy instead of just stopping robbers. This is not new territory, though Puckett does imbue it with some suspense, as in the final pages an alien whisks Supergirl off to a future she's destined to destroy by aiding the boy in the present. Unfortunately, this glimmer of uniqueness comes only at the end of this tale, and it takes a while (a long, silent while) to get there. 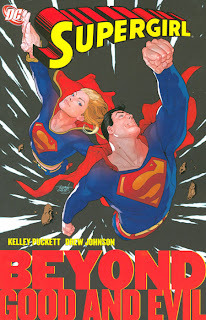 Indeed, the middle of the story has Supergirl looking back on Krypton such that she sees her father sending her to Earth -- an origin story that conflicts with Joe Kelly's origin just one trade earlier. I understand the thematic reason for this, as Supergirl's seeing Krypton die again makes her that much more determined to save the dying child, but again it's a far less edgy, more "vanilla" origin for Supergirl than what DC Comics recently established. Over in the Superman titles, Geoff Johns has slowly rolled out a new vision of Krypton, and my guess is that Supergirl needs to be revamped to go along with that; it's an awkward post-post-Infinite Crisis retcon (a la the current second revamp of Hawkman) that would no doubt confuse more casual readers. While we're on the topic, I also continue to be bugged by how writers portray Superman in the Supergirl title as this worrying fogey. I distinctly remember a conversation between Superman and the Kon-El Superboy where Superman talks about his love for Metallica albums and dance contests; Kon saw Superman as a friend and mentor, not as a third wheel. I don't mind some conflict between Superman and Supergirl, but as a fan of both titles, it's tiring to see Supergirl groan about Superman over and over, when the reader's supposed to relate to Superman elsewhere in the DC Universe. It makes me glad Supergirl will be a greater part of the Super-family with the next creative team, as maybe things will be more aligned. I was glad, by the way, to see Action Comics #850 reprinted at the beginning of this trade. While it suffers from some of the same "fogey Superman" troubles I mentioned above, the completist in me is glad to have it. I like the watercolor-like art from Renato Guedes here; Drew Johnson, who's work I liked on Wonder Woman, does an nice job on Supergirl, though she looked much older here than with Ale Garza or Ian Churchill. Kelly Puckett's Supergirl isn't bad, insulting, or embarassing by any stretch ... it's just slow. I'm eager for a team that can find a balance on the character where she's not over the top, but also has interesting adventures. Up next, a bit of Teen Titans (also featuring Supergirl) and then some Blue Beetle.